Beautifully variations in color tone make a magnificent carpet. This carpet gives a soft and cosy touch to your feet. This indoor area rug is hand loomed and has a low pile for easy vacuuming. This is ideal for a bedroom and a living room as well. 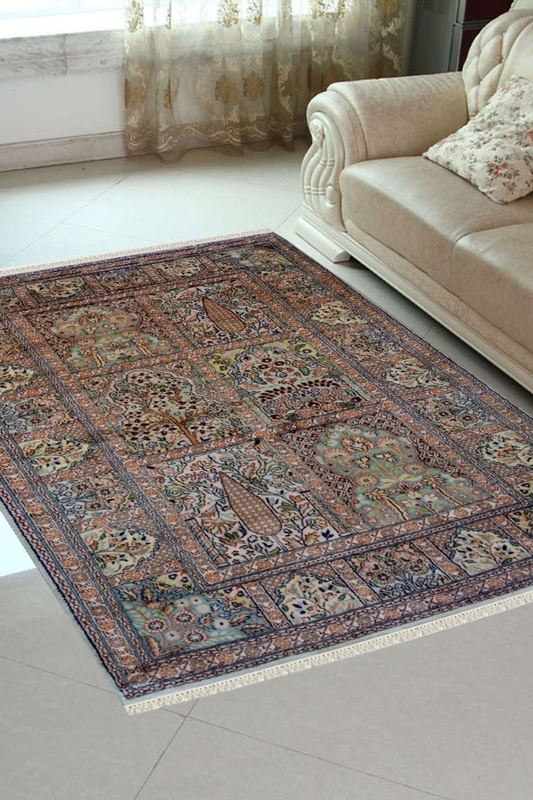 This is magnificently hand-knotted in pure Silk and cotton material. It contains Hamadan design pattern which is originated from Hamadan City. It is a very old and traditional design pattern which is very popular. The ground of this carpet is divided into boxes and each box contains a tree type design pattern. This is woven in multi-colors but the base of this carpet is in Powder Pink. This is an indoor rug and ideal for less traffic area.